After launching a comprehensive transformation program last year, Yum! Brands (YUM) is fast emerging as a high-growth company while also achieving significant cost reduction and margin growth. The restaurant chain is slated to unveil its fourth-quarter results Thursday before the market opens. Wall Street analysts expect the company to report earnings of $0.97 per share on revenues of $1.6 billion, which represents a modest increase from the year-ago quarter. 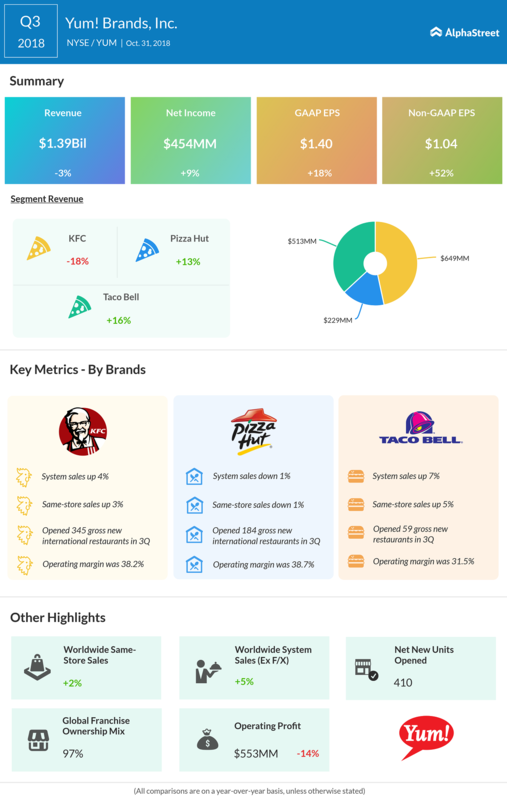 It is expected that the management’s refranchising initiatives – aimed at revitalizing the key brands of KFC, Pizza Hut and Taco Bell with focus on revenue growth – will enhance the December-quarter results. The general outlook points to a repeat of the trailing four quarters when earnings came in above estimates. Though the refranchising program, which involves reducing restaurant ownership through new franchise agreements, is expected to have a negative impact initially, the promotional activities and digital innovation conceived under the three-year program will boost revenue growth. It needs to be noted that the company-owned stores witnessed a slump in sales in the recent quarters. Going ahead, Yum! Brands will be able to use available cash to meet its investment requirements, thanks to the strong cash flow that keeps growing. Last month, the company appointed David Gibbs as its new president and chief operating officer as part of bringing innovation to the operations. 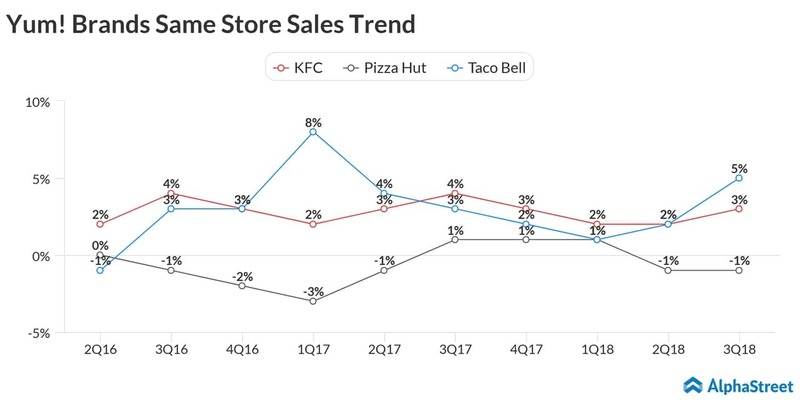 In the third quarter, a further drop in sales at KFC resulted in a 3% decline in revenues to $1.39 billion. However, an improvement in profit margin supported by the revised franchising arrangement drove up adjusted earnings by 52% to $1.04 per share. Both the results came in above market expectations. McDonald’s Corp. (MCD), another leading fast-food chain, last month said its fourth-quarter earnings more than doubled to $1.82 per share and topped expectations, owing mainly to a decline in expenses and lower tax provision. Revenues, meanwhile, slipped 3% to $5.16 billion. Shares of Yum! Brands hit an all-time high of $95 at the beginning of the month. Though the stock retreated slightly after that, it regained momentum in the following sessions. It gained about 19% over the past six months and opened Friday’s trading session higher.